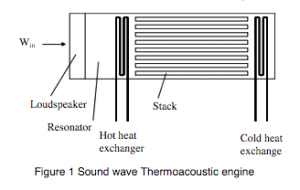 Thermoacoustic refrigeration systems operate by using sound waves and a non-flammable mixture of inert gas (helium, argon, air) or a mixture of gases in a resonator to produce cooling. Thermoacoustic devices are typically characterized as either ‘standing-wave’ or ‘traveling-wave’. A schematic diagram of a standing wave device is shown in figure 1. The main components are a closed cylinder, an acoustic driver, a porous component called a “stack, and two heat-exchanger systems. Application of acoustic waves through a driver such as a loud speaker, makes the gas resonant. As the gas oscillates back and forth, it creates a temperature difference along the length of the stack. This temperature change comes from compression and expansion of the gas by the sound pressure and the rest is a consequence of heat transfer between the gas and the stack. The temperature difference is used to remove heat from the cold side and reject it at the hot side of the system. As the gas oscillates back and forth because of the standing sound wave, it changes in temperature. Much of the temperature change comes from compression and expansion of the gas by the sound pressure (as always in a sound wave), and the rest is a consequence of heat transfer between the gas and the stack. A number of design concepts and prototypes are under development in many research establishments. The technology has the potential to offer another refrigeration option but improvements in design are necessary to increase COPs to the level of vapor compression systems. Research effort is currently directed to the development of flow-through designs (open systems) which will reduce or eliminated the use of heat exchangers. Thermal potential to cover the whole spectrum of refrigeration down to cryogenic temperatures. It is likely that potential market for food applications will be in the low capacity equipment such as domestic and commercial refrigerators, freezers and cabinets. Barriers to uptake of the technology. that of vapor compression systems. • systems operating on the thermoacoustic principle are not yet commercially available. • environmental considerations and legislation that significantly limits or prohibits the use of HFCs in small capacity, self contained refrigeration equipment. • limits imposed on the amount of flammable refrigerant that can be used in self contained refrigerated cabinets. • development of systems that offer efficiency and cost advantages over vapor compression systems. To improve efficiency and reduce cost, developments are needed in the design of stacks, resonators and compact heat exchangers for oscillating flow. Research is also required in the development of flow-through designs (open systems) which will reduce or eliminated the use of heat exchangers and will reduce complexity and cost. A form of Thermoacoustic Refrigeration will be used to assist in cooling the on board condensers for more efficient water collection capabilities. 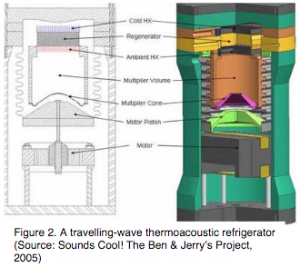 Acoustic Refrigeration can be used for cooling, or heating water.